If you’re a first-time user of antiX — welcome! Instead of a heavy common Desktop Environment, antiX uses window managers to control what the end-user can see and do. We hope these FAQs will give you a basic orientation to antiX and its window managers, and provide the means to explore further on your own. antiX comes in three flavours for 32 and 64 bit boxes. antiX comes as a full distro (667MB), a base distro (567MB) and a core distro (c222MB) all with a kernel that will boot "antique" PII, PIII computers as well as the latest "modern" processors. By default, antiX loads into a Rox-icewm desktop (antiX-base into a Rox-fluxbox desktop) with a few icons on the desktop. Use F6 at the boot menu screen to choose your desktop. What you choose running live will automatically transfer if/when installed. antiX is based on Debian and comes with a custom kernel. antiX also has its own custom scripts and repository to enhance user experience. antiX can be used as a rolling release distro ie you should be able to keep your applications up to date by regularly upgrading. If you wish you can enable the Debian testing or unstable repositories and live on the bleeding-edge! For those that prefer stability, keep to the Debian Stable/jessie repositories. So what are the minimum and suggested requirements to run antiX? antiX should run on most computers, ranging from 192MB old PII systems with pre-configured 128MB swap to the latest powerful boxes. antiX-core and antiX-base will run with 128MB RAM plus swap, but don’t expect miracles! 192MB RAM is the recommended minimum for antiX. 256MB RAM and above is preferred especially for antiX-full. antiX-full needs a 2.8GB minimum hard disk size. antiX-base needs 1.6GB and antiX-core needs 0.7GB. Which flavour should I use? Most users will be happy to use antiX-full as it offers a full desktop experience on legacy and modern computers. If you have a very old desktop/laptop with less than 256MB RAM (PII, PIII), or you want a desktop with "the basics", it is probably best to use antiX-base. If you want complete control over what applications to install and know the Debian system fairly well, then use antiX-core. Why are there so many F options in the boot menu? Choice! antiX tries to make it easy to boot on any hardware ranging from old boxes where booting with xvesa is needed to boxes with nvidia, radeon and intel drivers. I don’t want icons on the desktop, how do I disable them? Use F6 to set the desktop. Can I install applications when running live? Yes you can and if you decide to install during that live session, they will carry over to installation. I have an old laptop with very low RAM, what should I do? If you have less than 128MB RAM, it is best to use the cli-installer from the boot menu to install. It is also a good idea to create a swap partition before installation. Where should I install grub? If users are happy with their present bootloader, grub-legacy, grub2 or whatever else, then it is best to install grub to the root partition or don’t install it at all and then make the necessary changes after installation. If you are installing only antiX over another OS, or dual booting with windows, then install grub to the MBR. Will the language, keyboard settings I chose at boot menu carry over to install? Yes, in fact this is the best way to install your localised antiX. Set your options via the F keys and if you use a writable device, use F8 to save your choices. Alernatively, you can do this manually by setting a variety of cheats. For example: lang=en kbd=us,gr tz=Europe/Athens will give a US English desktop, a toggled Greek, English keyboard and the timezone set to Athens, Greece. How to Setup nvidia/ATI graphics drivers? antiX suggests using the smxi tools. See smxi section. The installer gives you the option to set auto-login. Control Centre-→Session-→Set auto-login You will need to reboot for changes to take effect. How to set the correct date and time? The best way is to do so at fist boot when running live. F4 has these options. Default is set to UTC. You are also given an option during installation to set the hwclock. The first issue is addressed with sudo dpkg-reconfigure tzdata. Do this first. You should also be able to just check the current value with cat /etc/timezone. Once you are sure the timezone is correct, you can work on setting your BIOS clock. Do this with the hwclock command. First do a man hwclock and then run hwclock --show to see what it is set to. It always reports in localtime which is why you need to first make sure your timezone is set correctly. Use hwclock --localtime or hwclock --utc depending on whether you want your hardware clock to be set to localtime or utc. Most pure Linux systems use utc. Most dual boot systems use localtime. Then, after you get your date command working via the sudo command you posted, you can use hwclock --systohc to set the hardware clock so it matches your system time. Again, you need the timezone and localtime/utc choice set correctly first (although if you want to assume they are set correctly already then this is the only command you need to run to get your changes to the date command to stick. If you assumed incorrectly then you will likely get mysteriously screwed by DST a few times per year). Finally, if you are having problems with hwclock drift or if you are a perfectionist then you can install the ntp package which will use time servers on the net to keep your clock exactly on time. But you have to first go through the steps above before ntp will work correctly. How to edit sources list? How to enable the Firewall? How do I find which applications to install? antiX-full comes with synaptic so searching for applications is easy. To search for applications in antiX-base and antiX-core use apt-cache search in a terminal. antiX is set up using Debian Stable repositories by default. This allows users to keep their system up to date with regular upgrades. antiX recommends using apt-get update followed by apt-get dist-upgrade. Alternatively, use smxi. DVD videos don’t play. How come? You will need to install libdvdcss2 and maybe some codecs by enabling the deb-multimedia repository (see above how to do this) and then either search for libdvdcss2 in synaptic and then install or use the command line. Alternatively, use the meta-installer application. antiX strongly advises users not to keep the deb-multimedia repository enabled as there may be conflicts. What window managers are available in antiX? the very minimalist manager JWM. the very minimalist manager SpaceFM-JWM. All window managers can be run with or without the ROX or SpaceFM Desktop environment that provides drag-and-drop functionality or the Conky system monitor that displays real-time information. antiX also comes with herbstluftwm,a manual tiling window manager . What are the min- options? If you want to keep RAM usage as low as possible, you can choose one of the min- options. 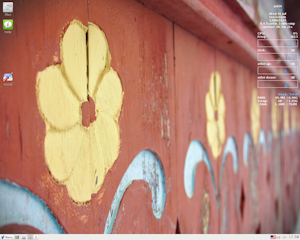 There is no wallpaper, no desktop icons, no conky and no applications running in the panel. How do I change from one WM to another? And how to set the default one? Whichever one you have running before reboot, will be the default. How do I get out of antiX? Click on the Desktop-→Logout there are several options including shutdown. Right Click anywhere on the Desktop -→ Exit, which will present you with the choice to lock screen, hibernate, reboot, logout, suspend, or shut down. For those familiar with the option in Puppy for persistent home via live USB, liveCD or fromiso: welcome! antiX now has a similar feature called antiX2usb and it is found in Control Centre-→ Disks. You can use fromiso live to install antiX to a USB stick via antiX2usb and you can choose to have a liveusb with persistence. You can do the same from a live cd/live usb or an installed system using an antiX, MEPIS or Debian iso file. Want to make a live iso backup of what you have installed on your hard drive? Then, this is for you! Simple, but effective. Not only have we made it easy to set up antiX live with persistence, we also make it easy to create a remaster of the running live system! Use the F keys to set up how you want antiX to boot in live mode and F8 to save the changes for future live boots! I don’t like that splash image. It takes up too much of my small screen space. How do I boot without it? Easy. Just press F7 console (F6 on core) and choose the default option. What do you mean by Safe Video Mode and Failsafe in the menu? Safe Video Mode Disable KMS (kernel mode set) video drivers and force the use of the vesa video driver. Try this option of the system seems to boot but the screen is blank. Failsafe Boot In addition to forcing safe video, also load all drivers early in the boot process. Try this option if the system does not boot at all. *Based on Debian Jessie, but without systemd nor systemd-shim. *Customised 4.0.5 kernel with fbcondecor splash *libreoffice 4.3.3 *iceweasel 31.7.0esr *claws-mail 3.11.1-3 *xmms -for audio *gnome-mplayer - for playing video *smtube - play youtube videos without a using a browser *streamlight-antix - new application to stream videos with very low RAM usage. What other changes since antiX-13? Ok, I want to use icewm without desktop icons, choose a colour background, and only have the volume icon on the taskbar. My box is new, so I want to reduce the startup delay and keep conky on the desktop. 1.Boot using IceWM option or change to it via Menu-→Desktop-→Other Desktops 2.Control Centre-→Session-→Global Desktop Session click on startup tab and comment # entries you do not want to use 3.Control Centre-→Session-→Global Desktop Session click on desktop-session.conf and make the following changes Startup delay "0" Notification dialog "false" 4.Use the Wallpaper application in Control Centre-→Desktop to set No wallpaper and a background colour. 5.Logout and log back in to your customised desktop. They will be saved on reboot. What kernel is antiX-15 using? Yes, OOTB! For some PII/PIII boxes, the latest flash will not work so antiX-15 32 bit isos ship with a working older version as default. The default Debian repository is set to jessie. Does this mean antiX is no longer based on Debian Testing? antiX remains a rolling release distro based on Debian Testing. Since jessie/Stable has just been released we have decided to give our users the option of sticking to Stable with this release or upgrading to Testing or Sid. Future releases will default to Debian Testing. Users really should have a look at the absolutely wonderful videos made by dev team member dolphin_oracle.